Earth Day Trash Bash, Iowa's largest Earth Day volunteer event, is a collaborative project between the Cities & citizens of Des Moines, West Des Moines, Clive, Norwalk, Pleasant Hill, Johnston, Urbandale, Polk County Conservation, Polk Soil and Water Conservation District, West Side Chamber of Commerce, Iowa Natural Heritage Foundation, Ingersoll Business Committee, Greater Des Moines Botanical Garden and Water Works. Thanks to corporate commitment to a better environment and a healthier community, in 2018, we had more than 1900 registered volunteers. 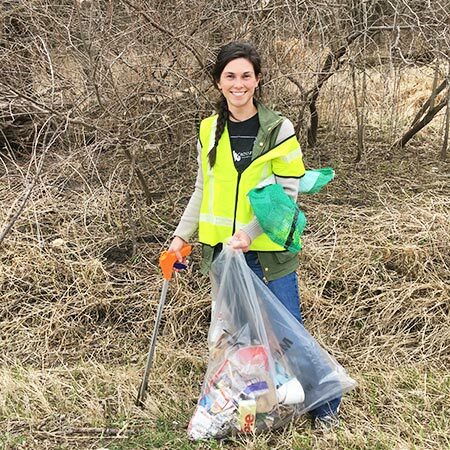 Last year, we had around 75 project locations throughout the greater Des Moines metro with volunteers removing litter, beautifying public lands and cleaning out invasive species. They removed over 81,000 pounds of trash, recyclables, tires, metal and brush, along with almost 34 pounds of cigarette butts, planted 200 trees, and recycled 3,400 plastic grocery bags. For the first time, the kick-off Bash was a ZERO WASTE event! Which means 100% of the waste from the lunch was diverted from the landfill! Friday, April 19 - Kick-off with a Bash downtown at Noon, including lunch, sponsor recognition and educational booths. After the kick-off bash and lunch, team captains will lead the volunteers out to their project locations for an afternoon giving back to the community. Gather your team for food, music by Bruce Day and educational booths! Commute to Assigned Site, Group Photo & Safety Talk. Earth Day Volunteer Projects (Greater Des Moines Metro Area). Saturday, April 20 Earth Day activities continue with volunteer opportunities and educational events. Give back, clean-up and find the “cached” prizes. Join us Easter weekend to go on a fun family eco-hunt. City of Des Moines Parks and Recreation, Iowa Geocacher's Association, Westwood Neighborhood Association, Walnut Creek Watershed Coalition, and other concerned citizens invite you on our unique hunt for trash. Help improve our creeks and central Iowa’s water quality! Volunteers will be wading through the creek, or walking along the trails collecting litter, tires, and looking for the GIANT plastic eggs, with a prize in each! Trash bags, grabbers, and gloves will be provided. We have a limited amount of waders, so please bring your own! Registration is not required but preferred. Walk-in registration is available day of the event. Earth Day Family Fun-Earth Day is a perfect day for you and your family to come enjoy some FREE family friendly outdoor activities. You can go kayaking, canoeing, fishing or you may to make a craft or relax in our outdoor lounge and enjoy a cup of coffee or cocoa! FREE tree saplings will be handed out to celebrate and the first 100 families will receive a painted lady caterpillar to raise. Come help us celebrate. Celebrate the sixth annual Downtown Earth Day Tour with the Greater Des Moines Botanical Garden, Iowa Rivers Revival, City of Des Moines and the Science Center of Iowa. Stop by the Science Center of Iowa (Special $5 admission) to visit City of Des Moines Naturalist Joel Van Roekel and plant some milkweed. FREE admission all day at the Botanical Garden is sponsored by Principal Financial Group. The Botanical Garden is open 10 a.m.-5 p.m.; activities run 10 a.m.-3 p.m. Enjoy a short walk or bike ride between these three locations and spend the day learning about environmentally friendly practices. Drop-in activities will be offered at each location. Each year, as part of Earth Day we try to share some type of environmental education messaging. Earth Day in the U.S. began in 1970 as 20 million Americans, from all walks of life, mobilized in an effort to change our environment. Today, Earth Day is celebrated by more than a billion people per year in 192 countries. Earth Day Trash Bash, a local event in honor of Earth Day, is Iowa's largest volunteer Earth Day effort. The 2019 theme is "Think Downstream" and we encourage all citizens to think about their impacts on our waterways and those downstream from them. Whether it is sediments, nutrients or plastics or other items in our water, we will work together to improve our water quality! We ALL need clean water to survive! For more information about ways you can improve your watershed, visit Des Moines' Water Works website or check out this great video. The Metro is divided into team volunteer project locations. Captains register their teams by April 3rd. Teams are then matched with projects. Captains must attend the April 5th Captain’s Meeting where they will receive a free Earth Day shirt as a thank-you for leading a team, lunch wristbands for the kick-off bash, safety information and project details. Volunteers will receive a free lunch at our Kick-Off Bash at Cowles Commons on April 19. PLEASE NOTE: Before you register, make sure your team is available for both Friday, April 19 and the rain date Monday, April 22. If it's just a spring shower we will work, but if it's lightening or the weather makes the projects unsafe, they will be rescheduled to Monday to make sure they still get done! AWARDS: Captains also encourage the team to participate in our fun awards. Nominations can be submitted by emailing pictures to trashbash@dmgov.org or posting them on Facebook, Instagram or Twitter with #trashbash2019, during or after the event. Show us your Team Spirit ... wear a team t-shirt, costume or anything to show you've got SPIRIT! Earn the Bigg Buttowski for most cigarette butts collected (weighed in at Cowles Commons). Snap a pic of Best Selfie or show us your unique find for the Finders Keepers awards. Ye Olde Bag can be won collecting plastic grocery bags to bring to the kick-off for recycling. The bags must be counted and bagged before you drop them off so they don't blow away on site. Attend the Captain’s Meeting April 5, 11:00 a.m.-12:00 p.m.
Friday, April 5, 2019, 11:00 a.m. - 12:00 p.m.
We could not help our community, the Earth or recognize these volunteer efforts without the support of our sponsors. The value of Earth Day volunteerism and sponsorship in 2018 was more than $215,000. Help make Iowa's largest Earth Day event a success again! While each year we try to reuse tools and supplies, as participation increases, we need your support and hope you will become a sponsor. Sponsorship is an opportunity to communicate to your employees that your company recognizes the importance of our environment and taking care of our community. 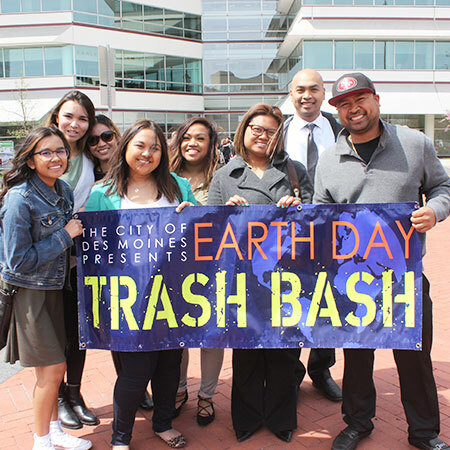 We have both Friday and Saturday Earth Day Trash Bash events that need your support. 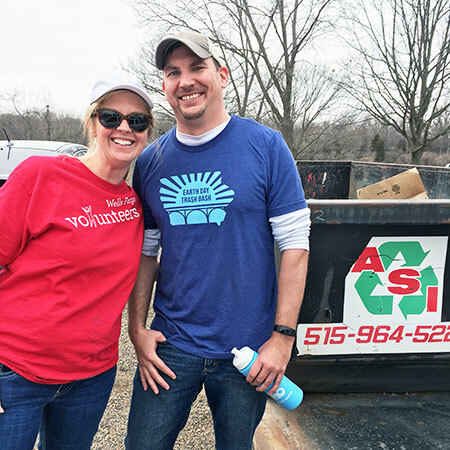 Sponsorship dollars help provide a volunteer kick-off Bash, volunteer recognition and continued volunteer support (such as dumpsters, portable restrooms, gloves, trash bags, project location signs and other tools/supplies) to beautify our community. Bronze, Silver and Gold donors receive verbal recognition at the kick-off event and during the captain's meeting. As a Diamond or Platinum sponsor, please review the sponsorship benefits. Thank you for considering this opportunity to make Earth Day Trash Bash 2019 a success. Cities & citizens of Des Moines, West Des Moines, Clive, Pleasant Hill, Johnston, Urbandale, Norwalk, Polk County Conservation, Polk Soil and Water Conservation District, West Side Chamber of Commerce, Iowa Natural Heritage Foundation, Ingersoll Business Committee, Greater Des Moines Botanical Garden and Des Moines Water Works.